What is salt and black pepper? About the ingredient salt and black pepper. Including 3,544 recipes with salt and black pepper, and where to find it. Salt and pepper is the common name for edible salt and black pepper, a traditionally paired set of condiments found on dining tables where European-style food is eaten. The pairing of salt and pepper as table condiments dates to seventeenth-century French cuisine, which considered pepper the only spice (as distinct from herbs such as fines herbes) which did not overpower the true taste of food. They are typically found in a set of salt and pepper shakers, often a matched set. 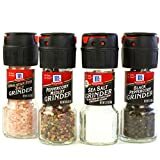 CONVENIENT: Bundle includes (1) Sea Salt and (1) Black Peppercorn Grinder, they are both small and convenient, for use at work, home and during travel. Grinder tops ensure fresh flavor Pretty and tasty - why settle for boring black and white? More detail Order now to save $0.51! Salt and black pepper is usually found in the spices section or aisle of the grocery store or supermarket. There are 3647 recipes that contain this ingredient.